I love this recipe for Caramelized Red Onions! This version or caramelized onions is naturally dairy and gluten free. This is another recipe that I found from SB Canning and have adapted slightly. I chose to use Cafe Zinfandel by Gallo, but you should feel free to use any red wine varietal that you enjoy. 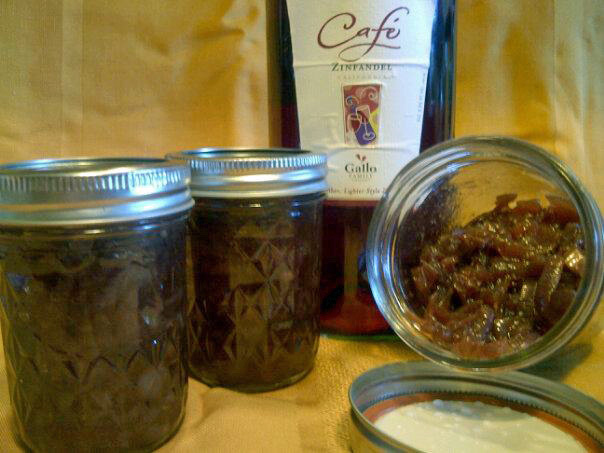 The Cafe Zinfandel adds another layer of sweetness and depth of flavor to the caramelized onions. Be prepared for this recipe to take some time to prepare what with the slicing of all the onions and the cooking process. However, it is nice to be able to prepare a large batch of caramelized onions and have them at the ready for when the whim strikes to use them. Canned caramelized onions are a great time saver! There are a multitude of uses for these Zinfandel Caramelized Red Onions. They are wonderful as a topping for burgers. They also allow for French Onion Soup to be ready in no time at all. Use these canned caramelized onions in any recipe that calls for onions to be caramelized. In one or two large non-stick heavy bottomed pans, saute the onions with the brown sugar over medium-high heat. Cook the onions, stirring frequently, until they are soft and turn a light golden brown. For this large batch it took about 45 minutes. Combine the onions into one pot if it was necessary to begin cooking them down in two pots. Add the wine and vinegar. Bring to a boil, then reduce the heat to low. Cook, stirring frequently, until most of the liquid is evaporated. As the liquid reduces take care not to allow the bottom of the pot to burn. For this large batch this step took about 45 minutes. Meanwhile, prepare the canner, jars, and lids. Season the caramelized onions with salt and pepper. Ladle hot caramelized onions into hot sterilized jars. Wipe the rims of the jars. Adjust the two piece lids. Water bath process half pints for 10 minutes at sea level being sure to adjust the time as necessary based on altitude. I always top my burgers with caramelized red onions but from now on , I am so going to change that with this stunning red onions topping! I so much love the wine in here! Waw! We had some just last night. DH had it on his burger and I had it atop some grilled chicken breast. So good!! What a great recipe! I adore caramelized red onions on italian sausage sandwiches. It would be so wonderful to have theses on hand, ready to go! Impressive recipe! I'm with you on topping chicken with these babies.